The Chinese, initially used to sit on the ground to eat and communicate with guests, as a symbol of respect to the eternal, the God, who was believed to be “above” all and the Chinese considered it to be disrespectful to elevate them above the ground. But as time passed, the Chinese people, primarily due to increase in power and reach, started using chairs and stools, mostly during the Tang dynasty, which started in around 600ad. By 1300 ad almost every strata of the Chinese society had moved 'up' to chairs and stools. Various historical data and pictures and paintings reflect that initial design of the Chinese chairs was mostly huge chairs with arm rests and protruding head way, which were later simplified to the horse shoe type chairs by the time of Ming dynasty. 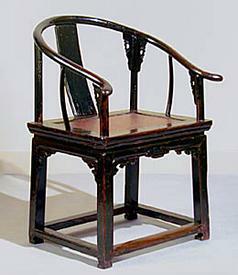 This refined art and design form of the chairs has continued since, with a little change here and there, but the overall framework remains quite parallel to that during the Ming rule. The Chinese are also supposed to have invented the 'folding' chairs, which would fold and unfold, depending upon the needs and space. This type of chair usage became popular very soon and was mostly used by travelers, who took these chairs along with them. Most of the chairs of the modern era are made of seating that is mostly nylon ribbons woven around a wooden or steel frame, offering a soft yet stable seating base. Chinese chairs may also come with an elevated foot rest, because many parts of Chinese mainland are really cold areas, and these foot rests were made to protect the feet from touching the cold floor. This is the basic chair type used in china, and is derived from the Ming era, the only minor differences being the usage of matting and jute fibers at that time, instead of the nylon ribbons and wood used now. Overall, the Chinese chairs offer comfortable posture, owing to ancient Chinese design knowledge and the knowledge of the Chinese about the body and its functioning, that is beyond the explanation of modern medical science. Chinese chairs also look fantastic, and owing to features like folding and height adjusting in some design forms, these are convenient to use also.